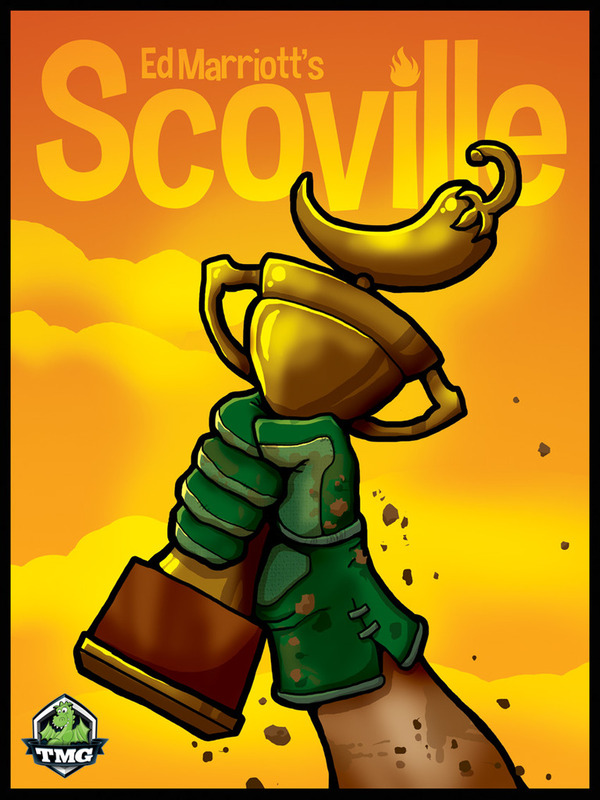 Scoville is played over a variable amount of rounds. In each round players first have an auction for turn order and for first picks of the “auction cards” that will award the player different chillies. After this the planting phase happens, where players get to place their chillies on empty spots on the shared plot. If you are the first to plant certain chillies you score points. After all players have planted new chillies in turn order it’s time to crossbreed and harvest. This will happen in reverse turn order (so yes it’s actually best to be last in the auction for this phase of the game). You first move your farmer on the shared plot up to three spaces, but you can’t move through other players, so you can get blocked from where you want to go (and block others from doing the same. After moving if you are between two chillies you get to crossbreed them and get a new chilli. What chilli you get is determined by the “Breeding Chart”, but in general the rarer the chillies you breed are the better they get when you breed them. You can even end up with the legendary ghost chilli (that’s represented by a fantastic see-through piece). After harvesting chillies it’s time for converting your hard-earned chillies into money and victory points. This is done a various different ways that including cooking multiple different chillies together to score points, selling them for money (the more of them are on the shared plot the more money you’ll earn), and finally trading them in for a combination of money, victory points and other chillies at the farmers market. 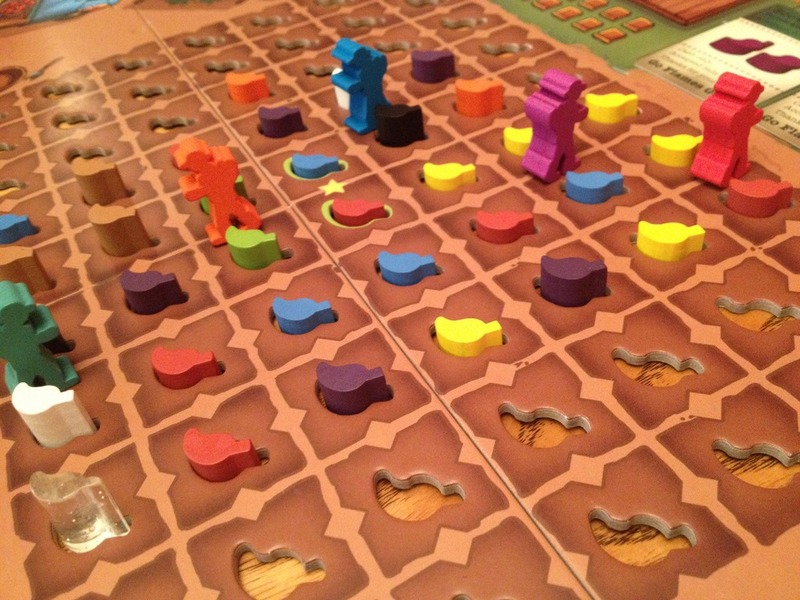 Scoville is a very well produced and well designed game. It has a lot of things going for it, and it’s mix of familiar mechanisms with a big twist of the shared plot that all players must navigate makes it even better. So why the low score you might ask? It’s because of one “little” thing I really disliked:the constant checking of the “Breeding Chart” when harvesting chillies. It made the game feel more like work or solving a math problem than actually having fun and enjoying myself. I know this might seem a little harsh, but I do felt it degraded my enjoyment of an otherwise fine game to the point where it got annoying. I’m sure that to some this is not a problem, some of you might even enjoy it, and if that is the case you should really check out the game. The game is well designed and has a very nice theme that ties very well to the mechanisms. While the rulebook is not long and the game in itself is not that complex it does take a few plays to really find out how to be efficient at it (and get to know the “Breeding Chart”. Also after a few games you will get better at anticipating other people’s moves and can block them.